So, you want to have and enjoy, but don’t know how to build a farm pond. You probably think that all you have to do is get a bulldozer, dig a hole in a low spot and let the rain fill it up. Wrong! 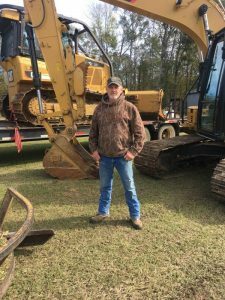 We’ve researched what’s required to build the best farm ponds by talking with two outdoorsmen who know plenty about this subject, Barry Smith of Pike Road, Alabama, and Trey Montgomery of West Greene, Alabama. We’ve learned about funding a farm pond with Michael Williams of Alabama Ag Credit. Barry Smith holds a master’s degree in fisheries science from Auburn University and was the chief of fisheries for Alabama’s Wildlife and Freshwater Fisheries Division and the co-founder and co-owner of American Sport Fish with his partner, Don Keller. These two men created the popularly-stocked Tiger Bass, using a female Florida bass that weighed 12 pounds or more and a super-aggressive male northern bass to produce these bass that grew faster and would attack lures and bait much more aggressively than the pure Florida strain of bass. how much money you’ll need to spend to build the pond. Your pond management consultant and contractor can tell you if the kind of farm pond you want to build on the type and size of your property can hold water through droughts and floods. A drawing of your farm pond and the land that will be impounded identifying ditches, gravel beds, cover and structure and other details will help keep the project defined and clear. Smith also recommends you contact the Natural Resources Conservation Service https://www.nrcs.usda.gov/wps/portal/nrcs/site/national/home/ that has technicians in some counties, that can provide information for you how to build a farm pond and suggest a group of contractors who have been building ponds in your region. Smith suggests you look at some of the ponds that any contractor you’re considering has built and that you talk to the landowner about how satisfied he is with how the construction on the pond has been carried out and learn all you can about how to build a farm pond. After your up to speed on how to build a farm pond, before any construction is started, you need to meet with and get advice and suggestions from a quality pond management service, especially if you want to raise fish in that pond for recreational fishing, commercial fishing or fish farming. If trees have to be cleared out to create the pond, save them to make brush piles about 50-75 yards from each other in the pond. When the bottom of the lake is cleared, you may want to put in a trench that’s a bulldozer’s width wide, running from the deep-water portion of the pond up to the shallow-water part. These ditches or trenches provide easy access for bass and bream to move from the deep water of the lake up into the shallow water where they can feed. You can use big limbs, logs or stumps too in the bottom of the lake to create structure. A company that makes concrete sewer pipes may have some cracked and broken ones, that will make productive bass habitat. Sometimes you can get them for free or at a minimum charge, if you’ll haul them off. Other people sink metal like old cars, refrigerators and other metal structures. However, metal will rust, deteriorate and have sharp edges that cut fishing line. 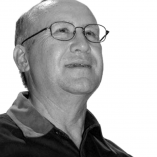 Barry Smith reports that, “That’s why I suggest using either wood or concrete structure when you’re building recreational or commercial fishing ponds. Of the two, I consider wood the best structure for building fish attractors. The pond-management company can help you with all these decisions before you start constructing your pond. “The cost of stocking and maintaining your pond is a figure you need before construction ever begins and then you’ll have a more accurate cost to discuss with your financial advisor,” Smith mentions. “You don’t have to wait until the pond is full of water to start stocking. 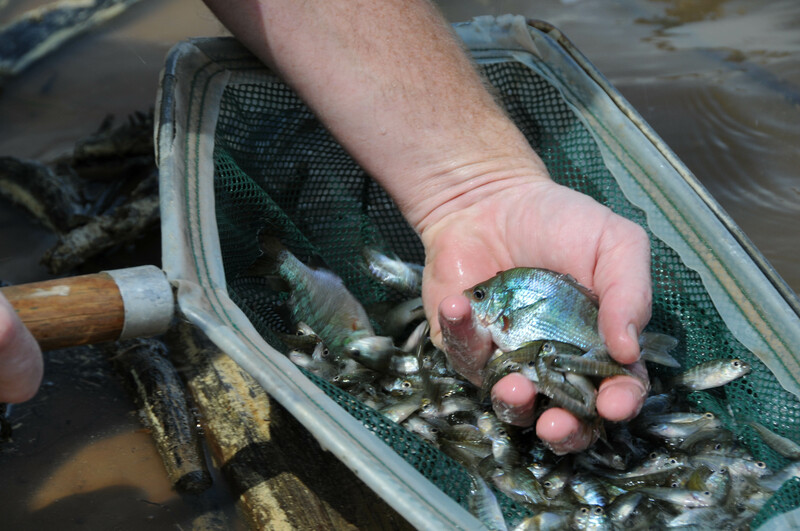 If you stock 1,000 to 1,500 bluegills per acre, your estimated cost will be about 30 cents for each bluegill, or approximately $300 per acre. Consultant Barry Smith recommends that if a farm pond is dug and begins to fill in the fall with water, you can stock bluegills so they can begin growing before stocking the bass in June. He also advocates stocking coppernose bluegills a faster growing and larger bluegill strain. Smith recommends to stock first into a pond the sunfish, bluegills and shellcrackers, that don’t need a full water pond for stocking. “Once four or five feet of water is in the deepest part of the lake, or the water’s that depth and is stained, bluegills and shellcrackers can be stocked successfully. Historically Smith has recommended stocking coppernose bluegills, because they show somewhat faster growth and take supplemental feed better than the common bluegill. Barry Smith likes three varieties of bass, the Gorilla Bass, an aggressively-feeding northern bass; the pure Florida strain of bass that grows quickly but can be difficult to catch; and the Tiger Bass that’s very aggressive and is a genetically-engineered bass that crosses the northern and the Florida bass. 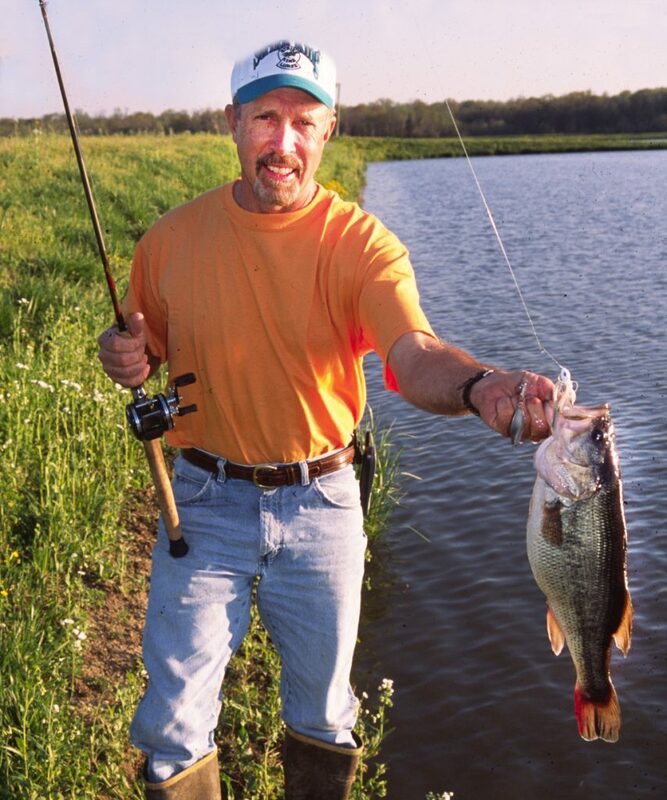 Smith explains that the Tiger Bass exhibits quicker growth than the northern strain of bass and exhibits more aggression (a willingness to bite) than the Florida strain of bass. Smith likes a battery operated feeder with an attached solar panel to keep the battery charged. Although you can buy inexpensive feeders for about $150 each, they don’t tend to be very reliable. 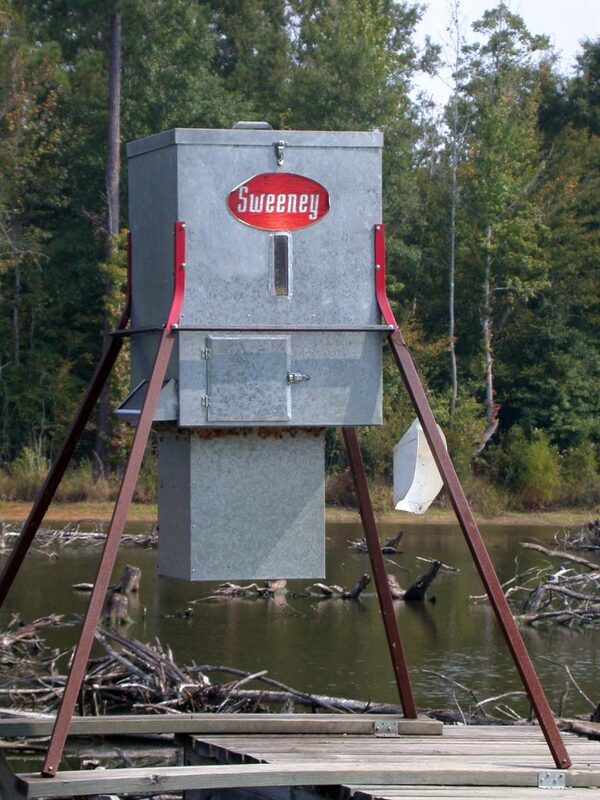 Smith recommends you spend about $700-$800 to each feeder for reliability and less maintenance. These feeders go off every day they’re programmed to, no matter the weather or your schedule. Fish feeders for farm ponds come in a wide range of different sizes, quality and prices and with supplemental feedings your fish will grow quicker. A consistent supplemental feeding program helps your fish grow bigger and faster than not having one. Be sure the feeder has a way to lock the lid down after it’s empty, because a storm can blow the top off the feeder if not and ruin the fish food inside. Also, people who come to fish will open the top to throw some feed out into the water to get the fish to actively feed and forget to put the top down. “I like a fish food that’s about 32 percent protein,” Smith says. Alabama Ag Credit, part of the Farm Credit system, is a lending institution that also pays dividends, and when you borrow money from one, you become a member of that association. These associations understand how building a farm pond definitely increases the value of the land and can be used to generate more income from that property. To get a better understanding of Farm Credit associations, we talked with Michael Williams, a relationship manager for Alabama Ag Credit https://www.alabamaagcredit.com/, an agricultural and land lender for central & south Alabama. Farm credit associations are located all over the United States and Puerto Rico. “One of the advantages of having a local Ag lender, like Alabama Ag Credit, is that we better understand the wants and needs of the people who buy or own land in our area,” Williams says. “We finance every kind of property, business or interest and everything related to agriculture like tractors and other equipment. We provide lines of credit for farmers, and we also loan money for the construction, stocking and maintenance of farm ponds, boat docks and piers. My Alabama Ag Credit appraiser estimates that a pond or a lake increases the value of land by $4,000-$5,000 per acre. Doing your homework and learning as much as you can about how to build a farm pond helps your credibility when you talk to a financial institution about funding. You can contact Williams at 800-579-5471, 251-743-3560 or michael.williams@alabamaagcredit.com. or not you need to meet with the U.S. Army Corps of Engineers before he starts digging. Trey Montgomery and his wife, Pam, the owners of Leavellwood Lodge and the Lakes of Leavellwood, have been in the pay-to-bass-fish business for over 20 years. What started out as a conservation project has resulted in their fishing business and they had to learn about how to build a farm pond from scratch. 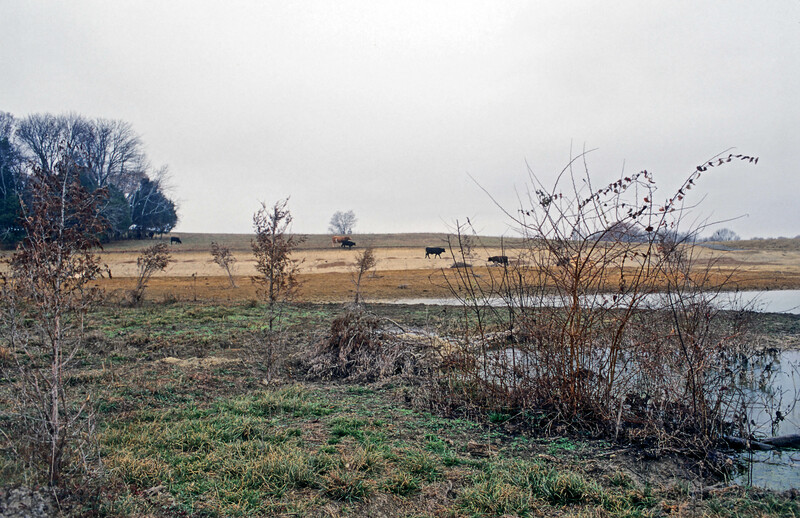 “One of the reasons we decided to build a lake was due to the erosion on our property,” Montgomery recalls. “Because of poor farming practices in the 1970s and 1980s, a piece of the land we’d bought was facing some serious erosion problems. To stop the erosion, we built our first lake and then a chain of lakes to slow down the runoff on the property. One lake wouldn’t hold all the runoff from our land. Building lakes that flowed into other lakes enabled us to stair-step the rainwater down and stop the erosion. “Currently we have 107 acres of water on this property, Leavellwood Lake with 35 acres, 42 acre Sleepy Hollow Lake and 24 acre Sawgrass Lake. 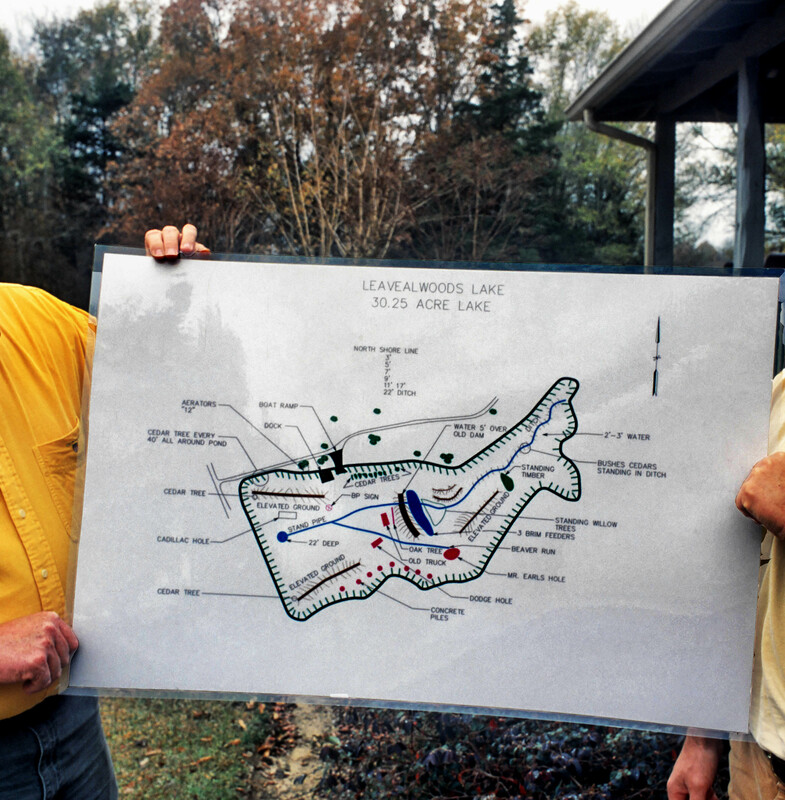 When I built my first lake, a friend of mine, Paul Bracknell, already had built and managed several trophy bass lakes called Dream Lakes in central Alabama. He shared with me his years of experience of building, managing and growing numbers of big and trophy bass. He also shared with me why he had put structure in the lake and the type of structure before he filled the lake with water. I learned from Paul how to manage hot water, cold water and the effects of shadow and shade. I also learned why structures of concrete and wood seemed to hold up the longest and provide the best habitat for bass. I listened to his advice and began to build my lakes from his recommendations. “I also took the knowledge I’d learned from fishing on Alabama’s Gulf Coast about how artificial reefs could attract and hold red snapper. We discussed the type of structure we wanted to put into our lakes even before construction began. I had a friend in the dirt moving business, who had built cattle-watering ponds and commercial catfish ponds. I hired him, and we sat down and discussed my goals and hopes for building lakes for trophy-bass fishing for a fee. I was convinced he was the man to build my lake. “I visited the lake site every day. We built underwater mounds and put pea gravel on top of them as bedding sites for bass and bluegills. We also dug ditches and drains from what would be shallow water out to what would become the deepest part of the lake and left some trees in the lake. We used a bulldozer to move around and place some concrete structures and brush. Before the Montgomerys got into the fishing business, they had farmed corn and soybeans. Then when the market for corn and soybeans bottomed out, they started raising hay and cattle. Although the Montgomerys began building lakes to stop erosion, they discovered that lake building could become expensive very quickly. Trey Montgomery decided to begin selling weekend fishing trips to try and help defray the cost of building the lakes and began to learn how to build a farm pond. According to Montgomery, “Today our rates are $325 per person to fish for the day, which includes a boat and a motor and lunch at our lodge. For our overnight packages, we charge $450 per day which includes three meals, lodging and the use of a boat and a motor. All you need to bring is your fishing tackle and overnight bag. “If you want to hire a guide, our rates are an extra $100- $175 per day, if the guide furnishes his own boat and tackle. Our guides have fished these lakes for a long time, and they’re familiar with what the bass are doing, and where the bass like to hang-out at certain times of the day. “When I’m asked how many bass can a person catch in a day here, I ask, ‘What’s your experience level in bass fishing, and what type of tackle do you have?’ If an angler is a fair bass fisherman and has pretty-good equipment, he or she can catch and release 40-50 bass per day. Even catches of 100 bass per day aren’t uncommon. An angler who catches 40 bass in a day will pull in some good-sized bass, generally several three to five pound bass. When the Montgomerys first built their lakes, they wanted to provide a place where anglers could come and have one of their greatest days of bass fishing ever, anywhere, and have the possibility to catch the biggest bass of their bass-fishing careers. Leavellwood doesn’t promote its bluegill fishing, but their lakes home numbers of good-sized bluegills. Often, a customer may start out bass fishing, and then once he or she sees the size of bluegills available, he may choose to finish off his day fishing for bluegills. To learn more about Lakes of Leavellwood and Leavellwood Lodge, go to www.facebook.com/leavellwoodlodge and the webpage at www.leavellwood.com, or call 205-372-2323. John E. Phillips of Vestavia, Ala., started his fishing career when only 2-months old with his family at the Magnolia River and his deer-hunting experiences as a child at a Greene County hunting club. He’s wrestled a bear, jumped out of an airplane and canoed from Birmingham to Mobile – always pursuing the latest, greatest fun in the outdoors. 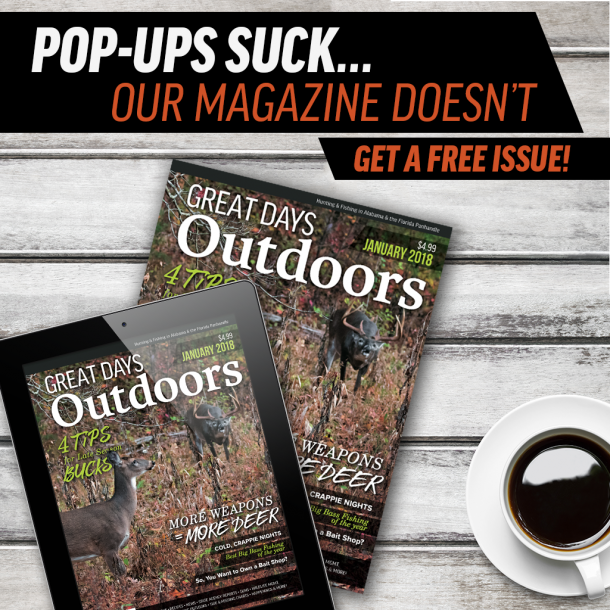 The author of 100 print and eBooks and numerous magazine articles, John has loved his outdoor writing career of the past 40+ years.